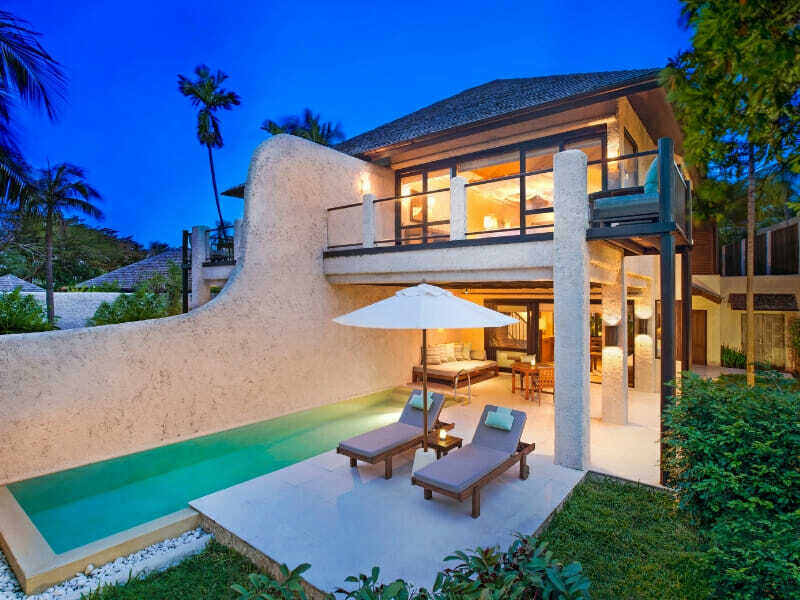 This hidden retreat has been designed for travellers who are looking for a quiet and relaxing getaway in a luxury setting along the picturesque Thai coast. 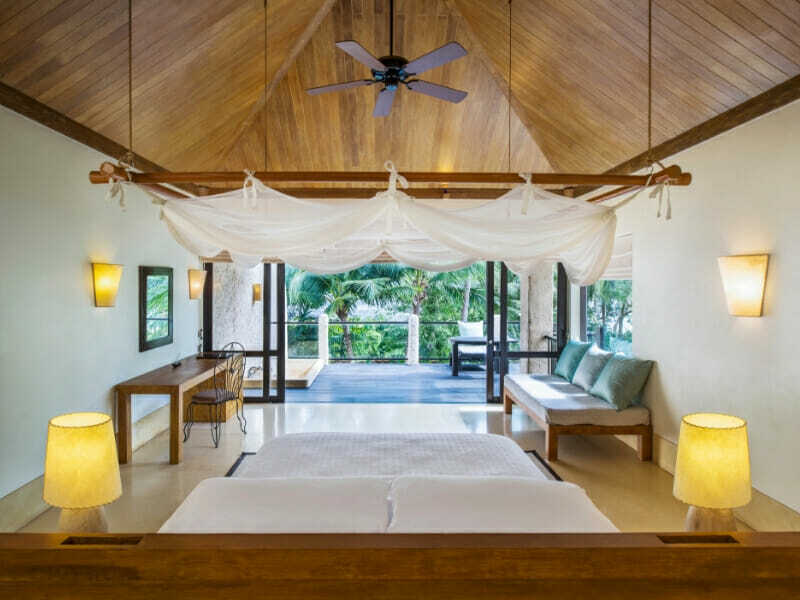 The amazing private villas are perfect for unwinding and leaving the stresses of the world behind. This beautiful stretch of coastline is well removed from the crowds and busyness of the major tourist areas and you can focus on enjoying some downtime. The resort offers guests all the amenities you could want during your stay and the friendly team will make you feel welcome and at home with their 5-star approach to looking after guests. 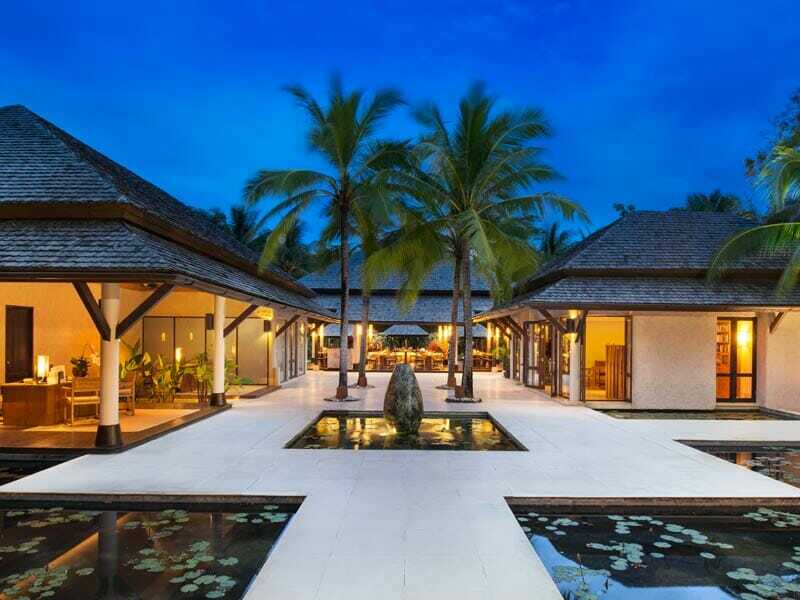 With just 53 private villas in the resort, you never have to deal with crowds and noise. The wonderful infinity pool is surrounded by gardens and shady palms trees and is a lovely spot to relax in a sun lounge, let your worries melt away and enjoy the warm Thai weather. When you’re hungry the resort has 2 restaurants serving dishes from varied international cuisines, so you are certain to find something to suit your tastes. Dine in the tropical gardens beside the Lotus Koi Pond or perhaps you’d prefer panoramic ocean views, the choice is yours. If your fitness regime is important to you, the resort has a well-equipped fitness centre with cardio machines and free weights when you feel like a workout. There are endless paths and tracks for walking, and exploring the local area on the complimentary bikes is both fun and great exercise. 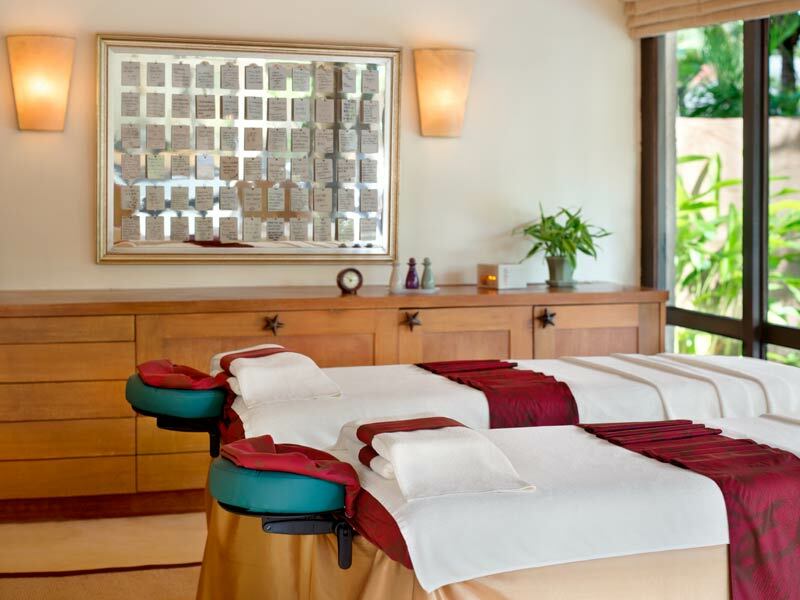 A fantastic range of relaxing massages and invigorating spa treatments are available in the convenience and privacy of your own villa, all delivered by an experienced and friendly therapist. Why Go to Sheraton Hua Hin Pranburi Villas? 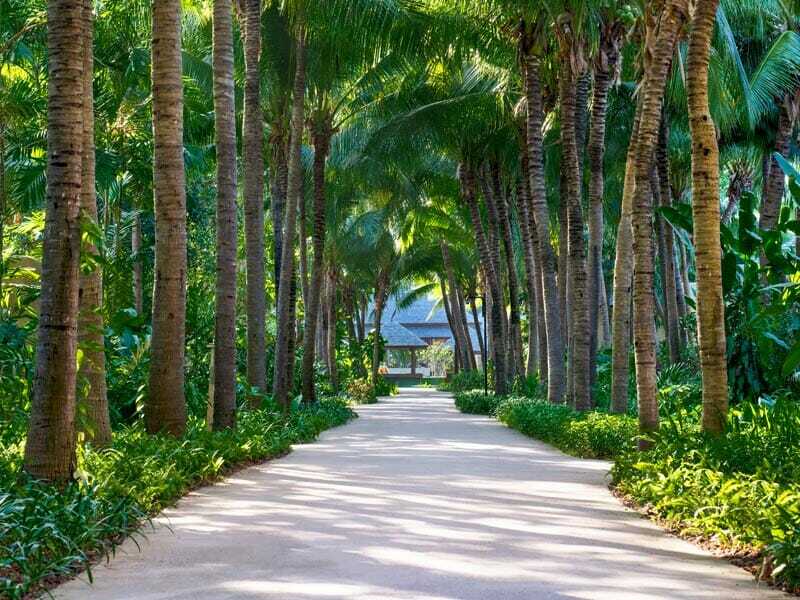 This resort has been designed as a peaceful retreat where you can renew and rejuvenate. With the mountains on one side and the pristine Gulf of Thailand stretching away on the other, you will love this location and have the opportunity to experience the authentic Thai lifestyle that is going on all around the resort. The luxury accommodations are world-class and built with your privacy in mind. There are never any crowds to deal with and you can expect absolute 5-star service from the fabulous staff. If this sounds like your perfect holiday to Thailand, give us a call now on 1300 000 753! This huge 273sq. metre villa features impeccable luxury styling that creates a relaxing and uncluttered space. 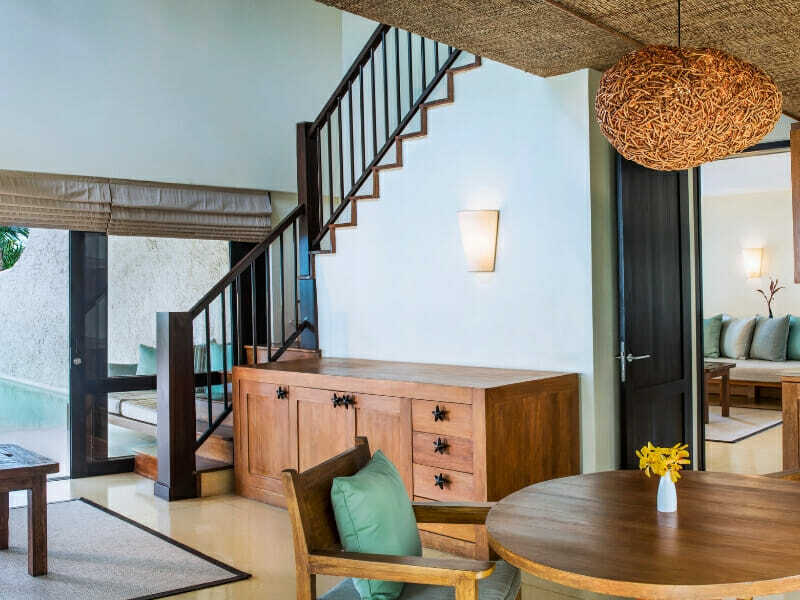 The 2-storey villa has beautiful natural timber and quality furniture pieces throughout and the high vaulted ceilings and open plan design give it a feeling of openness. 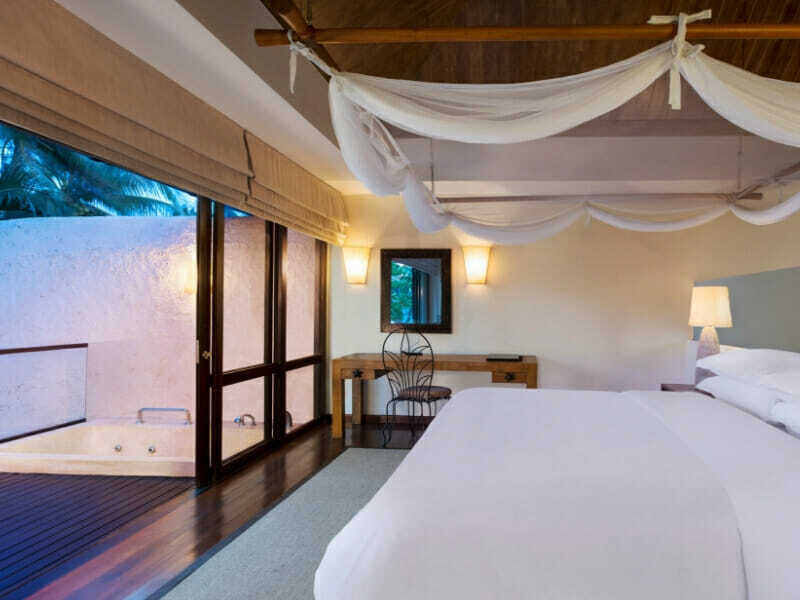 Upstairs, the massive bedroom has a King-size bed and opens out to a private balcony with a spa bath and views over your pool. Downstairs the living area extends outside into your private terrace and garden area. The villa is fully air-conditioned and for entertainment comes with a 46-inch TV with premium cable TV channels. There is also high-speed Wi-Fi and an ultra-fast, wired internet connection. The bottled water is complimentary, there is a minibar for your convenience and you have facilities for making tea and coffee. The resort is set on the pristine Pranburi coastline south of Hua Hin, a major regional centre located about 200-kilometres from Bangkok. Normally you will fly into Bangkok and make your way to Hua Hin via car, bus or train. This is a beautiful area and you’ll find lots of things to do and see around Hua Hin. You can experience some authentic Thai culture here, without missing out on the luxury amenities that make life easy. Relax in the privacy of your own terrace and courtyard, surrounded by lush tropical gardens and palm trees, with your personal pool to use at any time you want, this is truly a perfect spot to unwind and enjoy some downtime. If you’re feeling more social, head down to the main pool area, where you can kick-back in a sun lounge around the pool area and soak up some wonderful Thai sunshine. Talk a stroll along the waters edge and enjoy endless views across the calm ocean. The resort provides bikes that are a fantastic way to explore the local area. When you go slightly further afield, you have several historic temples to visit, both day and night markets to browse at Hua Hin and you can also take a half day tour to get some local insight into everything this lovely region has to offer, including the interesting historical and cultural background of the area. Our villa was magnificent with beautiful furniture, spacious layout and our own private patio and pool (great for relaxing). The food was delicious and service outstanding. Staff were courteous and helpful at all times. We thoroughly enjoyed our stay here.